When the Smart Museum of Art exposes students to the history and beauty of its collections, the results of that exposure are two-fold. Making art accessible to young people begins with the museum’s docent program for University students, who then pass on their knowledge and insights about works of art to third- and fifth-graders from 13 area schools. “Art can be life changing, so it’s exciting to introduce kids to art and make them comfortable talking about it and being in a museum,” said Kate Casey, a fourth-year studying art history and one of 38 student docents. Casey and fellow docent Anastasia Barron, a third-year student in the College, led a group of 30 fifth-graders from Beasley Academic Center around the museum on an interactive tour in January. “It’s great to see an appreciation of art awaken in these kids. Some of them really get it,” said Barron. Still, she and Casey had their work cut out for them. They had to frequently remind the fifth-graders not to touch or lean against the art. And a sign of the times came when an animated video in an adjacent gallery grabbed the young students’ attention. It was tough to get them to return their focus to the gallery they had been touring. But Casey and Barron were able to bring them back to the paintings and sculptures they had been viewing and to evoke some insightful comments. While studying an abstract sculpture of a clarinet player, Casey asked why the artist might have created such a complicated object. “To make people look at his art longer,” was the reply. Discovering that specially trained University students provide an excellent way to reach out to the community, build sustainable programs and foster long-term relationships with local institutions, the Smart Museum of Art has recently increased its student docent program. Although it’s common for museums to train community volunteers as docents, the Smart Museum relies on students to conduct tours, field trips and programs both at the museum and in local schools and community centers. Even more uncommon, the Smart Museum pays students for their work. But the program offers College students far more than just a job. It helps them develop new skills and engages them with residents of the surrounding communities. The student docent program had modest origins in 1998 and grew slowly. Thanks to the recent endowment, however, the museum has increased its ranks of docents from 30 to 38 this year. Nineteen, selected from a pool of almost 70 applicants, are now in training. With more docents employed, the museum will be able to offer more organized gallery tours than ever. Last year, for example, about 700 grade school students participated in the museum’s multi-visit programs. Next year that number will climb to more than 1,000 students representing 35 classes at 13 grade schools. 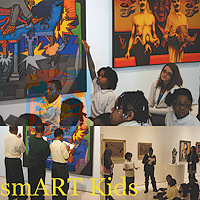 The multi-visit programs are open to third-graders (Art in Focus) and fifth-graders (smART Explorers). Both programs consist of multiple visits to the Smart Museum (three and four, respectively) spanning a number of weeks, and a student component at the Hyde Park Art Center. The fifth-grade multi-visit program culminates with a private evening event at the museum, during which the students present what they have learned to parents and friends. Other Smart Museum programs that rely on the docents, including one-time museum visits, museum tours for high school students and adults, Family Days, and smART Kids @ the Library, also are expected to grow. smART Kids @ the Library is a drop-in art workshop and story time for families. First offered at the Chicago Public Library Blackstone Branch, the program expanded last year to the Bessie Coleman Branch. Next year, the program will double in size, with workshops at both branches every month. The variety of programs, workshops, tours and community outreach allows the museum to have a deep and lasting impact at the schools with which it works, said Peterson. The Smart Museum of Art’s student docent program involves broad training—extensive readings, weekly three-hour seminar discussions during the Winter Quarter and shadowing experienced docents on tours. Potential candidates are interviewed and hired during the Fall Quarter and trained during the Winter Quarter, when they can begin to work in programs such as Family Days. During the Spring Quarter, they are able to begin conducting museum tours. The docents also are given great flexibility in choosing which galleries and pieces of art to discuss. And in programs such as Art in Focus and smart Explorers, they get to know the students on a first-name basis. Most docents first get involved in their second or third year and stick with the job until they graduate, according to Lauren Boylan, Manager of Tour & Teacher Initiatives at the Smart Museum. “The majority of them are passionate about the work and can’t imagine having a better campus job,” she said. “Without art, life is grey,” said student docent Casey. “This has been such a good experience that I might continue working in the museum world after graduating.